In its last Board meeting, SEBI accepted certain recommendations and subsequently issued a circular regarding the criteria for clubbing of Investment Limits under SEBI FPI Regulations 2014. Earlier, FPIs belonging to one investor group, i.e., entities with a common shareholding, beneficial ownership or beneficial interest of more than 50% either directly or indirectly, together could not hold more than 10% of issued capital in a company. A subsequent interpretation adopted by SEBI for ‘beneficial ownership’ had an extensive scope and attracted heavy criticism. For instance, the term now included Managers of FPIs even if they didn’t personally own any investment. Several major global asset management funds would be affected and AMRI (Asset Managers Roundtable of India) predicted capital outflows of $75 billion which would in turn affect the domestic currency and stocks. 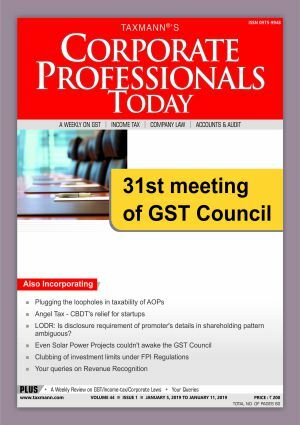 SEBI constituted a working group headed by H R Khan to propose changes to FPI Regulations and the Group in their Interim Report recommended that the criteria for clubbing of investments should be common shareholding of more than 50% or common control and that the existing interpretation should not be applicable. In its December 13 Circular, SEBI adopted most of the recommendations including certain instances of types of appropriately regulated Public Retail Funds where the clubbing of FPIs will not be applicable along with specific agreements with foreign countries or countries with a federal structure. The circular has provided clarity and relaxed the criteria for clubbing, however, it has left certain terms such as ‘appropriately regulated’ ambiguous which may be a cause for chaos and confusion in the future. Author: Sumit Agrawal - Regulatory Lawyer, ex-SEBI Officer & Founder, RegStreet Law Advisors. Disclaimer: This information is updated till 14 January 2019. Following are the major changes introduced in the new Income-tax return forms applicable for Assessment Year 2019-20 for the incomes chargeable to tax under the presumptive taxation scheme. The CBDT has issued ITR forms for A.Y. 2019-20. These changes have been made with respect to reporting of deductions and exemptions available under the Income-tax Act. Can an amount be an "Income" just because TDS has been deducted? The common question arises in the assessment that since the amount is credited in Form 26AS, i.e. the payer has deducted the tax and deposited into the Government Account, it is income of the assessee. Read here to know more.